Hi! We are Mollie and Amy from Two Nutty Teachers Teachin’ from the Same Tree, and we have been playing the “What If” game for quite some time… What if we completely emptied our classrooms and created a new environment that felt inviting, comfortable, and highlighted all of the things we feel are key to student success? This year we finally got brave and took the leap. This summer we asked our custodians to not return the furniture to our rooms after cleaning them, and we started imagining all of the possibilities. 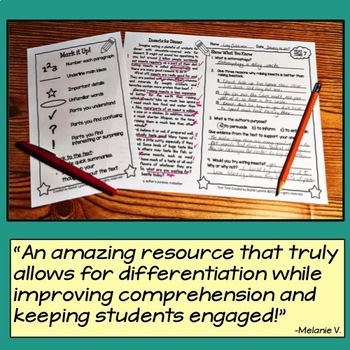 We wanted to embrace our students’ learning styles and learning preferences, so we knew variety was key. We also wanted to ensure that there were several places in the room where students could collaborate. We are in LOVE with what we came up with, and the best part is the response we have received from our kiddos and their parents. Here is a picture from the door to the classroom. As you can see, there are a variety of places for students to sit. There are three round tables that seat four students, the center island that also seats four students, three two-student tables, three individual desks, and a kidney table. In addition to the tables and desks, there is ample floor space for students who would rather sit on the floor to work. This is the center of the classroom, and the table was the first thing that was placed in the room. The table has four stools from IKEA and is anchored by two shelves that were also purchased from IKEA. The stools really help the room to seem less cluttered and the kids like having a choice between traditional chairs and the stools. We also have a few cozy places for kids to sit and work, including disc chairs and a futon. Behind the two disc chairs, there is a long countertop that we keep cleared off for those students who would like to stand while working. 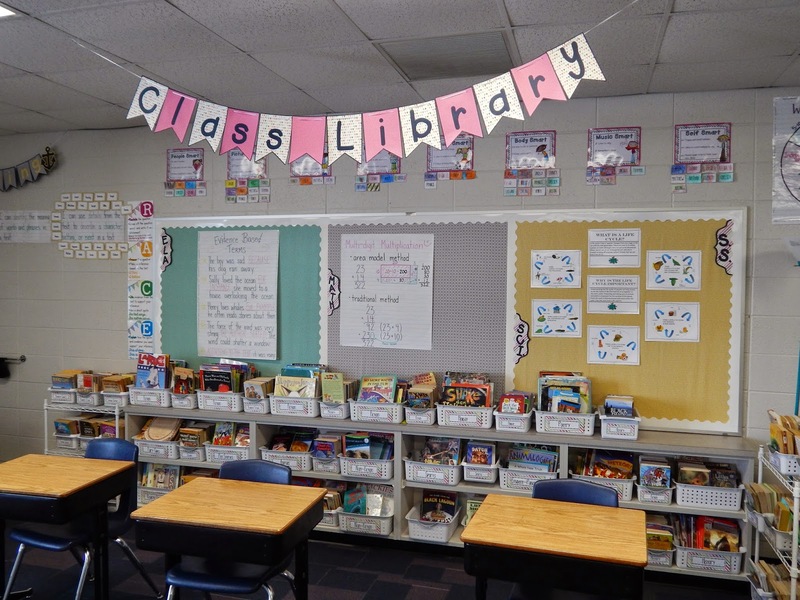 Here is our class library, which also houses anchor charts for our core subject areas. There are three desks in this area where kids can work independently. Many questions ask if this is where our kiddos who are not on task sit, but it is not. This space is reserved for kids who choose to work on their own. This is our gathering area and where I conduct a majority of the lessons throughout the day. It works perfectly because the students can choose to sit on the floor or on the bench, and I have access to the document camera and interactive whiteboard. This is the kidney table where students can collaborate or where I can pull a small group for instruction. Visitors always ask how we manage our students and their supplies in a classroom design like this. Each student has a white box (in the picture below) and a binder. This gives them a space to hold their personal materials (although we have community scissors, crayons, pencils, markers, etc.) and a way to organize papers into subject areas. 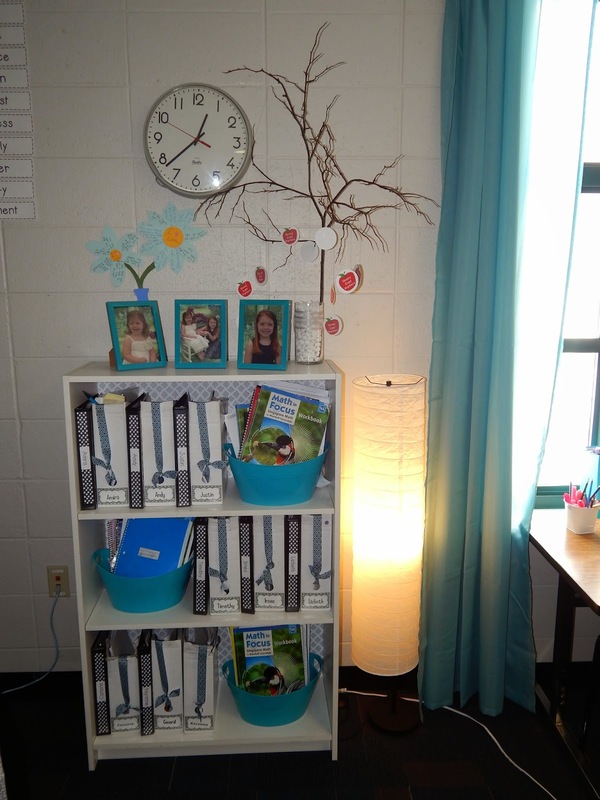 The white boxes are spread throughout the classroom so that students are not on top of each other when they are getting their materials. Students store their library books in these book bags hanging on a series of hooks my sweet hubby created for me. I have two hook racks in the room (one in the front and one in the back) to help with the flow of traffic when students are asked to get their books for SSR. To help students stay on track, we allow them to continue choosing where to work, as long as they are making wise choices (I send my kiddos off every day with the words, “Find a place where you can be successful!”). If students are not focused and on task, they may be asked to move their number to the “First Notice” column. If they continue to make poor choices, they no longer have a choice, and the teacher chooses where they will work for the remainder of the time period. We also needed a way for students to collaborate during the focus lesson, so we assigned each student a partner for various subject areas. When students gather in the gathering area for a lesson, they sit by their partner for that subject. It makes turn and talk much easier. We are a couple months into the school year and, so far, there isn’t anything we would change. We are looking forward to conducting a short survey with our kiddos and their parents to gather feedback on how the room is working for them. 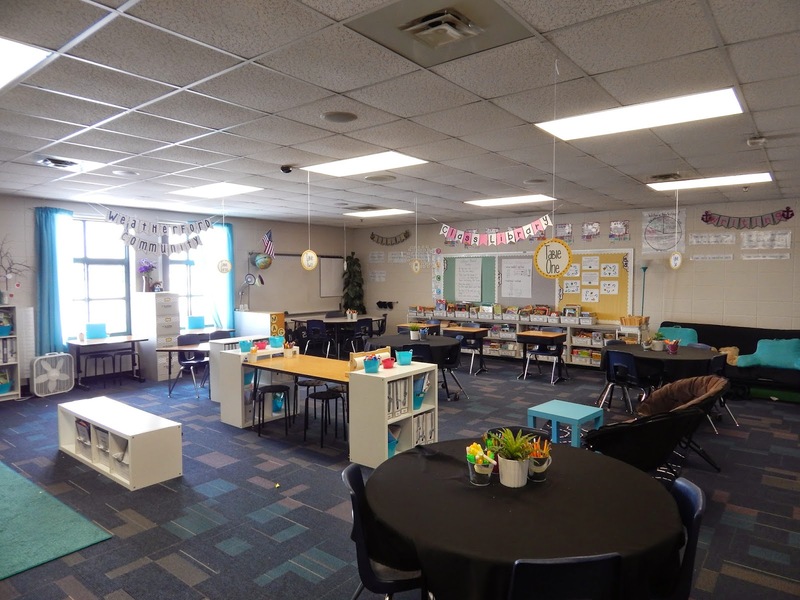 If you are interested seeing pics from Mollie’s room (all pics in this post are from Amy’s room) and hearing more about how the layout of our rooms is helping us to meet the needs of all of our learners, please hop on over and visit us at our blog. Mollie and Amy are Two Nutty Teachers who strive to find fun, exciting, and engaging ways to deliver curriculum to their fourth grade students. 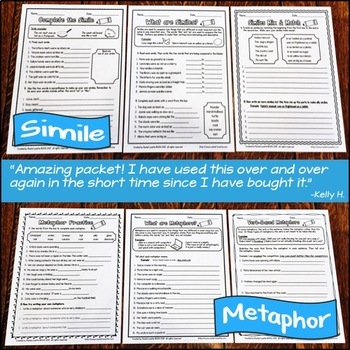 In addition to working together as teaching partners, Mollie and Amy enjoy sharing their curriculum creations in their Teachers Pay Teachers store. This is amazing. I wish I could spend a day with you to observe how this works. Is there extra planning due to all the stations? What does your schedule look like? So many questions, but I love this idea. Please share more! Thank you! How large is this room? It looks much larger than my classroom. I would love to do something very similar in my classroom! Thank you so much! We would love to have you visit! We do not have extra planning for the stations. They are just part of our literacy block. I would say our schedule is pretty typical. I think it would make an additional blog post! Check out our blog and in the next few days and I will put something together. 🙂 Thanks for the idea! I think our classrooms are pretty typical in size. I think it looks much bigger in the pics. Off the top of my head I am thinking it is 24 x 24… but I am not sure about that! Thanks again for your kind comments! I love this and am trying to think of how I can do it in my 5th grade class. Do you conduct all whole group lessons on carpet? Is there arguing over where to sit or who to sit with. What if they all want comfy chairs? How do you manage it? Fantastic idea if you have the space- I can barely fit 4 tables in my classroom let alone all those work stations! We do have our kiddos sit on the floor during whole group lessons and we do not have arguments over who gets to sit where. Mollie did set up a schedule for sitting on the bench during the lesson but it was not necessary with my kiddos (I have kiddos with lots of energy this year and they would much rather to sit on the floor). As far as the cozy chairs in the room, I have not had any issues with kids not sharing. Everyone has their favorite places to sit. It seemed to just work itself out. I will keep you posted on what happens with a new group of kids next year! I was wrong about the classroom size when I responded earlier. It is actually 30 x 30. I have 27 kids and there are enough chairs in the classroom (not including the cozy items) to have 30 kids sit in a chair. It is amazing how much more room there is now that we do not have desks. My room felt crowded and congested with 27 desks so if you feel that way with your room now, I suggest giving it a try. It is the best move we have made as educators. It truly is AMAZING!!! I love this design! I have been thinking something very similar for my class next year but couldn't find any examples to go off of. I do have one question. How are you attaching the numbers on the student choice monitoring area? I didn't see any Velcro, so are they just taped up? Do you have to re-tape or putty them often? I absolutely love this idea! I would love to do this with my second graders. Do the students find a spot to sit for the whole day or each time you send them to do work throughout the day? 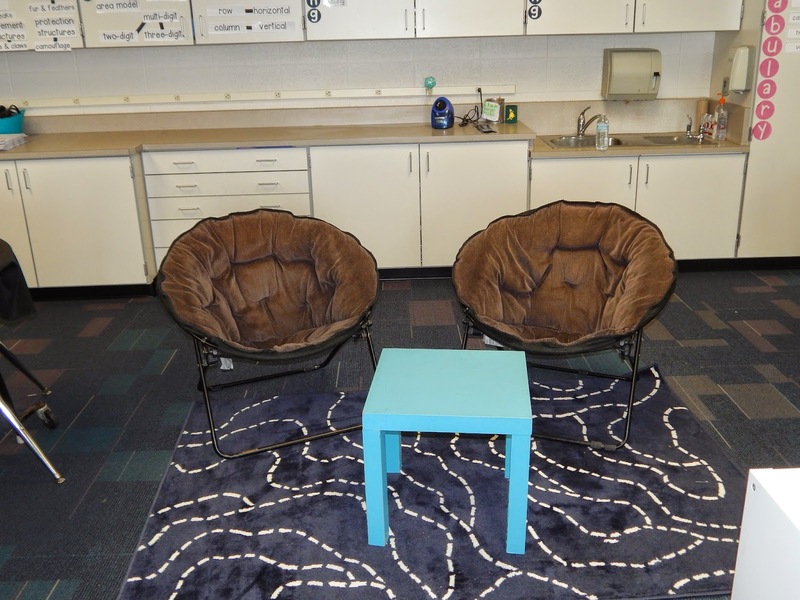 Do you ask the students to choose a new spot each day so everyone will have a chance to sit where they want? I am new to second this year, coming from K., and this setup looks a lot like a K. Room. Of course without the option of sitting where you choose. 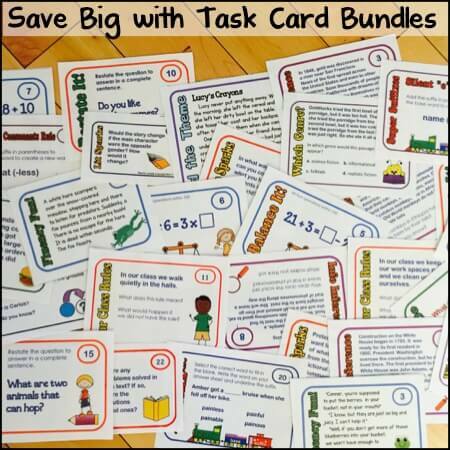 Also, do you do literacy centers throughout the day? I am still thinking on this idea! I have another question, what do you do with the students textbooks? I didn't see any in the pictures and was just curious about how the students got to them to do their work or if you used the document camera to project the books so they didn't have one. Thank you so much for posting! I am so excited about doing this in my classroom. I am going to try it this last week as a trial run for next year! We are loving all of the questions! Keep them coming! Victoria, we use sticky putty to put the numbers up (and just about everything else in the room!) and I did not need to replace any of it this year. Maria, the kiddos find a spot to sit any time we send them off for group, partner, or independent work. We have not had to place restrictions on students needing to choose a new spot each time. I have to be honest, it has really been amazing to see the students step up and make these decisions on their own. So many of the kids have different preferences that they don't all tend to want to sit in the same spots. You would think that students would all flock to the couch or the comfy chairs but everyone has a different place they like to sit best and their preference seems to change depending on the task and time of day. We do not use a lot of text books in class so that has not been an issue however, I don't think it would be too much of a problem if we did. We have a math textbook (Math in Focus) but we do not get it out much. We screen shot much of what the kids need and put it in an ActivInspire to use while we are teaching the whole group in front of the projector. My one big suggestion is no matter what you storing (independent reading books, binders, writing journals, etc.) try to have multiple places in the room where they are stored so that when you send kids off to get something they all go to a different part of the room to avoid a traffic jam. Last but not least, we do Literacy Stations daily. We teach a 30 minute mini-lesson whole group and then students break off into their station work for a half an hour. This gives us an opportunity to pull small groups for extra support. Next year we are going to incorporate Guided Math into our day and that will also involve stations. Let us know if we missed any of your questions! Thank you so much for all the information. I talked with my principal and he really likes the idea. I love the way you do not have to put restrictions on where they sit. I guess I am more worried about that than anything. I do not want a child to feel left out because the same kids want to sit together all the time. However, when I tried it this last week of school, it seemed to really flow. My students loved it! Thanks again for all your inspiration! How did your admin feel about this set up? Were they supportive? What did you do for state testing? Did you have to bring in desks? Are you planning on doing this again next year? What changes are you thinking of making? What problems came up with this set up? How did you solve them? Thank you!!! I'm thinking of trying this next year since I'm moving out to a portable. Our administrator was very supportive. We originally wrote a grant to purchase all of the necessary seating arrangements so we had a lot of research to back up what we wanted to do. Unfortunately, we did not get the grant but Mollie and I are both a little obsessive (hence the name, Two Nutty Teachers) and we were not willing to give up on our vision! Our administrator took time to talk with us about roadblocks she saw that we might run into which helped us to proactively create procedures to avoid issues. Our state testing is now all done on the computer so we go to the lab to complete the assessments. It just happened that we had perfect timing for this! We do have enough seats in our class for everyone to sit at a table so we may still have been able to do it if testing was still done in the classroom. We are TOTALLY planning on doing this again next year. I don't think I will EVER go back. Right now there is not a ton I plan to change. 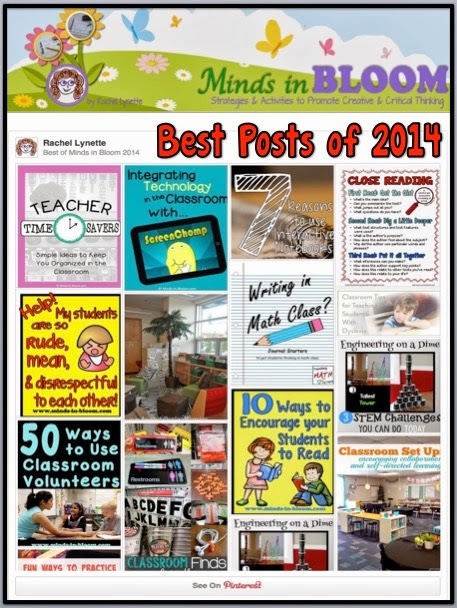 I will be writing an end of the year blog post about our experience on our blog (twonuttyteachers.blogspot.com) in the next week or so. We are giving our kiddos a survey this week to see what they thought of their experience and we want to include some of their thoughts. One thing I know for sure that I am going to tweak a bit for next year is my classroom jobs. 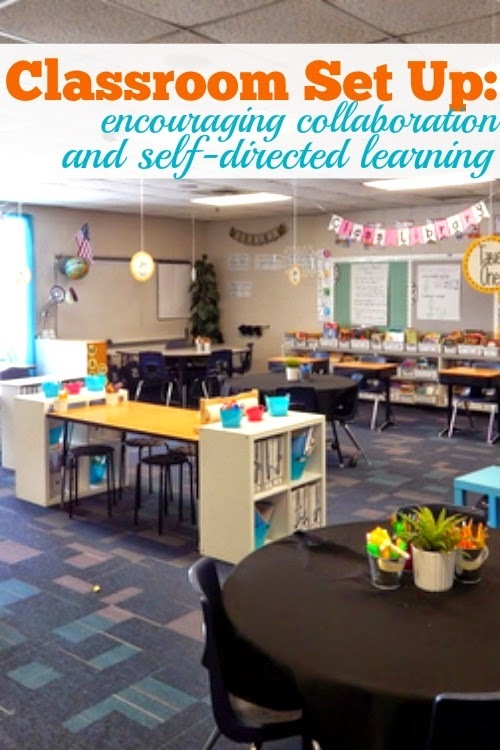 Since pretty much every space in the classroom is a community space I feel that I could use a strong team of kiddos who are interested in keeping our classroom organized, stocked, and ready for learning throughout the day. One thing that we did this year that was a result of talking with our principal was we had what we called "home bases" which were assigned seats for the kids. When we had a guest teacher, students were asked to sit in their home bases for the day. This helped the guest teacher to not feel overwhelmed by the management of the room and it gave them a chance to have a traditional seating chart to refer to throughout the day. We also had decided to use the home base if we were having one of those off the wall, full moon kinda days. If the kids were struggling to make good choices and to accomplish what needed to be accomplished, we would simply ask them to move to their home base. The kids obviously did not like this and wanted to continue to make their choices so this happened VERY rarely. I used it once or twice in the first quarter and never needed to again. Choice is a POWERFUL thing! Please keep the questions coming! We love sharing this big shift in our teaching with you. It has been the best move I have made in my fourteen years of teaching. This is a great idea! 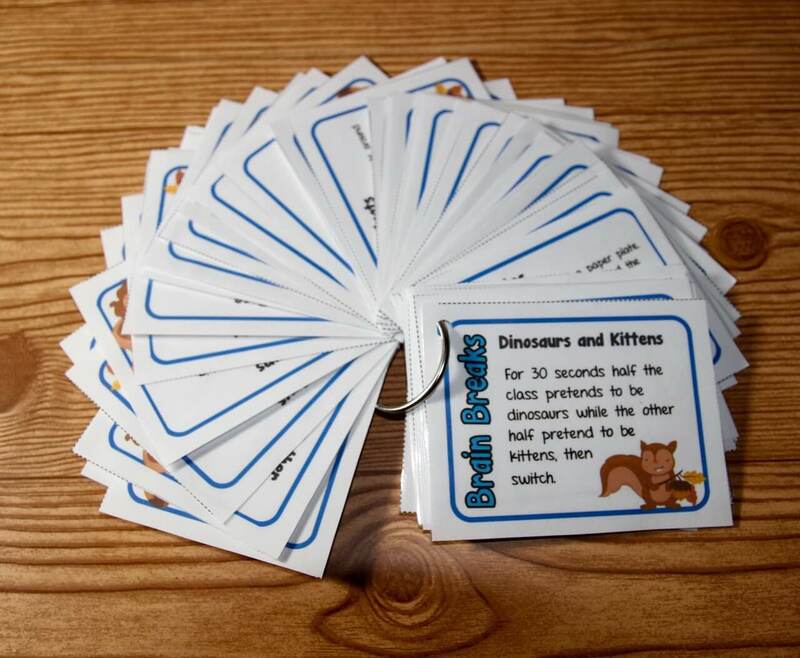 I am really interested in trying something like this with my second graders next year. I have a few questions though. First, how do you roll out the "choice" of where to sit in the beginning of the year? Do you assign kids seats in the beginning and then eventually let them choose where to sit? Or does the choice happen on the first day of school? What/how do you teach your kids to help them understand how to make a good choice etc.? Also, where do the kids keep their personal materials (pencils, folders, notebooks) if they may be sitting in a different place at different points throughout the day? 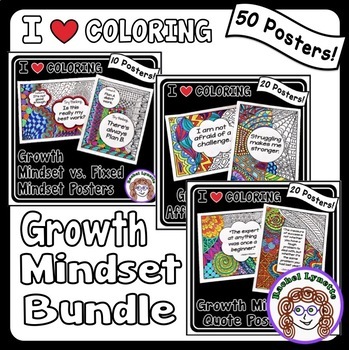 Hi MrsTeacherLady! We pretty much dove right in at the beginning of the year. We teach fourth grade so they may have been a bit more prepared to make choices like that due to their age. 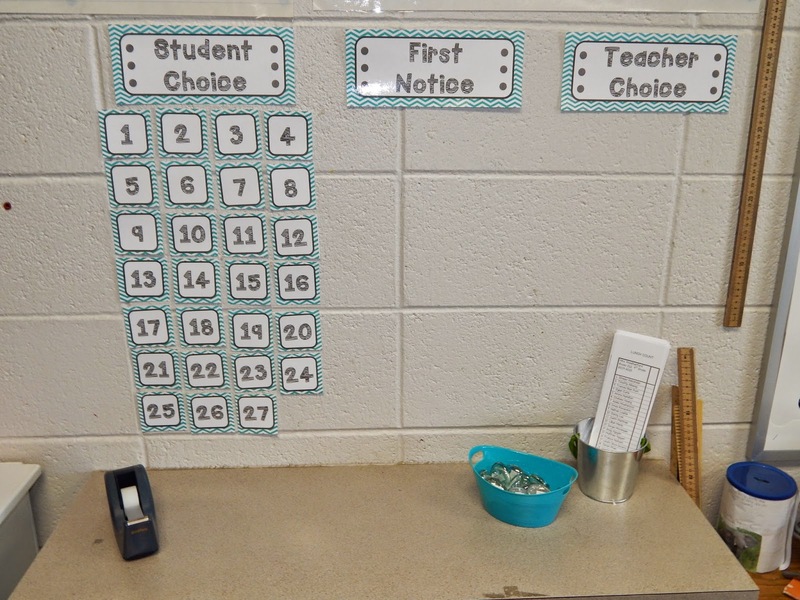 We have the individual choice system (shown in one of the pics) where kids are free to make their own choices as long as they are positive choices and if they are making poor choices, they have a "first notice" and if they are still struggling, it becomes teacher choice. I think this worked well for us because a majority of our kiddos were able to make good choices, so it was just the select few that needed a little more support in the beginning. 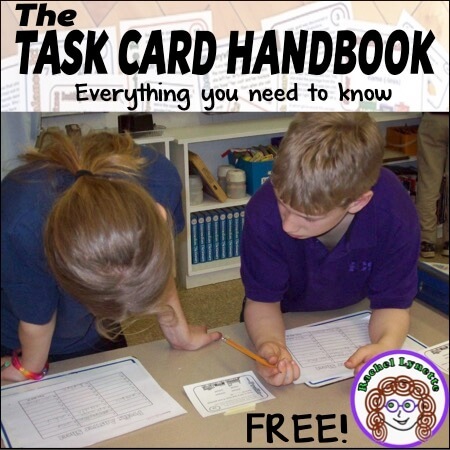 We do a lot of work at the beginning of the year on multiple intelligences, what on task work looks like and sounds like, as well as goal setting. All of this is connected to making good choices. As students are making choices in where they sit, we talk to them about whether or not their choice is helping them to meet their goals. It was extremely successful for us and took a lot less transition than I expected. We also have our "home bases" which is an assigned seat for everyone so if there were too many students who were struggling (which this only happened a couple of times in the fall) they were all asked to go to their home bases. The kids keep their personal things in the white magazine boxes you see in the pictures. We also use two binders. One is our Literacy Binder which keeps our reading and writing materials. The other is our "Keepin' it all Together" binder where they have poly-pockets to keep their math, science, social studies, and unfinished work in. This worked well for us this year. I hope that we answered all of your questions, don't hesitate to ask if you have more! Good luck with the new classroom design! Where do the kids eat? We have to have table and chair seating for all students to eat at once. Our kiddos eat in the cafeteria. We do have enough table/desk seats for 30 students though. It may not look like it because it is so open without the desks, but we wanted to make sure that if we needed everyone sitting at a table/desk, that we had enough. 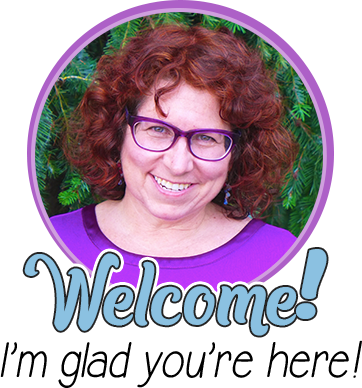 I LOVE this setup – and am gearing up to try it next year! It will be my first time teaching 4th grade, so I thought I would change class layout too! I had one quick question about student supplies – to make sure I understand how you store them correctly. From what I'm reading, each student stores things like notebooks in their white magazine box, and any loose papers in their binders? If they have nicer stuff (like mechanical pencils, calculators) that parents would be upset about sharing, do you have them store that in a separate place? Do you think it would work to use folders instead of a binder? I'm thinking I'd like kids to have folders for each subject's papers, and store them in their own personal box or in a bucket with a group. Do you think that would work? Thanks for your thoughts!!! I am SO excited about this set up! I moved to 5th grade last year and really liked it, however there was way to much direct instruction as I worked through the new curriculum. I'm going to implement Daily 5 and Daily 3 this year and was looking for an open classroom that would allow space for the kidos to work. This is it! I went over to the blog to look at the feedback on last year you mentioned in your last comment, but I didn't see it. Could you tell me the date it was posted so I can look again? I'm going in to school tomorrow to get measurements and meet with custodians to see what they may be able to pull together for me. I excited but nervous! Thank you so much for checking out our blog! Can you believe the summer got away from me and I had not posted it yet! I got caught up in a few blog link-ups and a book review and had not posted yet! I just wrote it! Your question was enough to get me moving! 🙂 If you head back over to our blog, it is today's post! If you have any other questions, don't hesitate to ask! We love talking with people about this topic! I promise you will LOVE it!!! Take care and hope to hear about your journey! I love your posters with the learning partners on them! 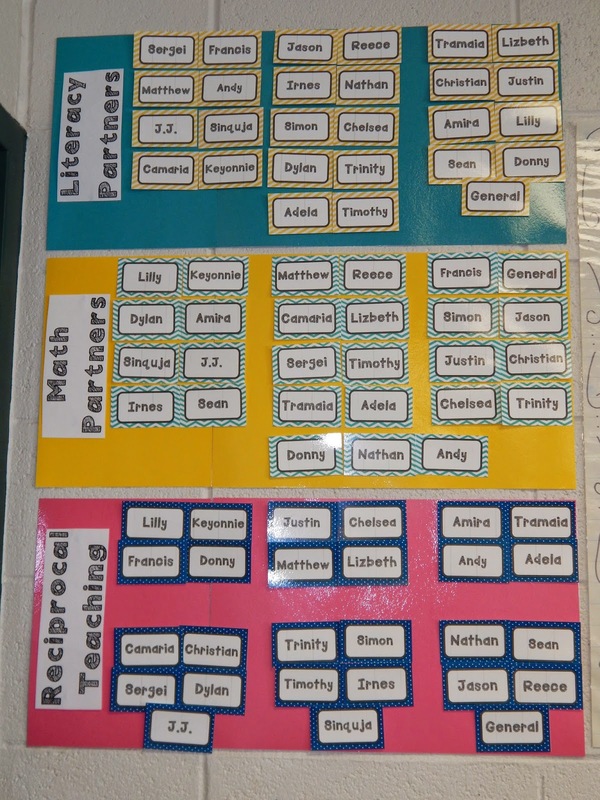 What is reciprocal teaching? Thanks so much! 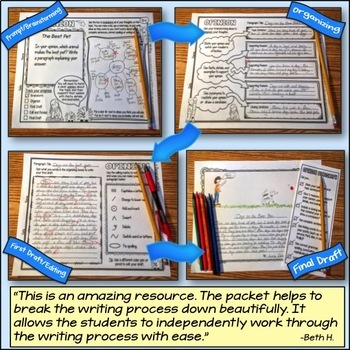 Reciprocal Teaching is a format that allows students to use four comprehension strategies and a structure to understand an informational text. The four strategies are: Predicting, Clarifying, Questioning, and Summarizing. 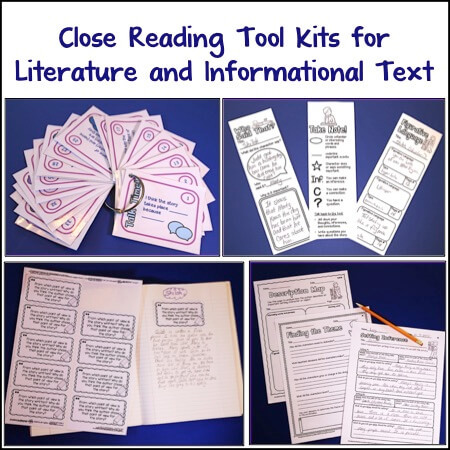 It has been a very important part of our reading instruction for the past few years and we have seen great improvement in our students' ability to comprehend informational texts. I hope this helps a bit! Feel free to email us at twonuttyteachers@gmail.com if you have any questions! I absolutely love this idea and definitely going to work towards this next year. I just have 1 question, when cutting and pasting or writing notes, do you still allow them to sit in the soft chairs or do you have them come to a hard surface to work? Thank you so much for sharing this. Best of luck with your new design! You will LOVE it! Your post has me so excited!!! I have been thinking of this exact set up, but couldn't put the whole picture together. You 2 did that for me, thank you!! Lol I'm ready to push past this year and do this next year. I will be spending the year getting the furniture together to set this up. I have a smaller room with the same amount of 4th graders, so this year will give me the time to think of the set-up. I will definitely reach out with any more questions. This looks great! I've been asking to do this for a few years but my school OT says it isn't a good idea because the kids won't be at adjustable height desks/chairs so things can't be fine tuned to give students the best writing posture. Have you run into pitfalls like this? I hope this helps and best of luck to you! I love this room set up! Thank you for helping me put all the pieces together as I begin to implement this type of leaning in my second grade classroom this year! 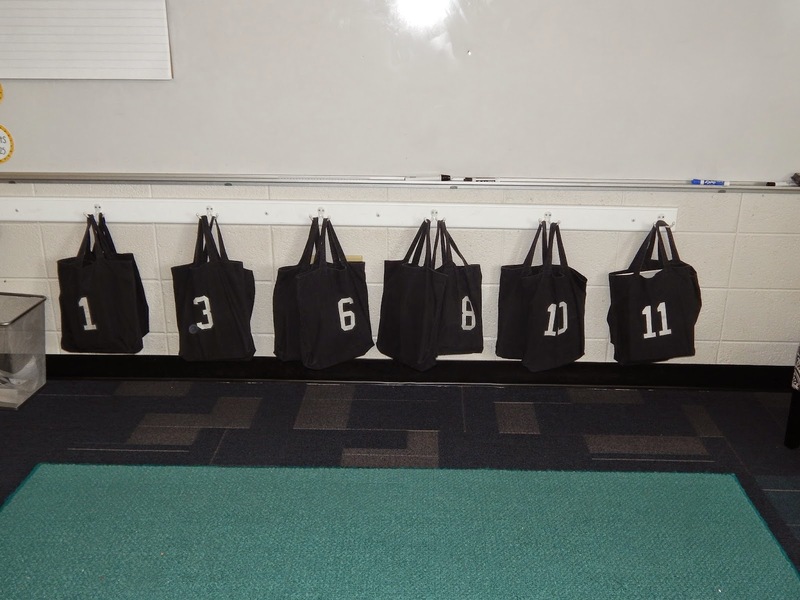 Just a couple of quick questions, where did you get the black reading bags from and how did they hold up throughout the year? 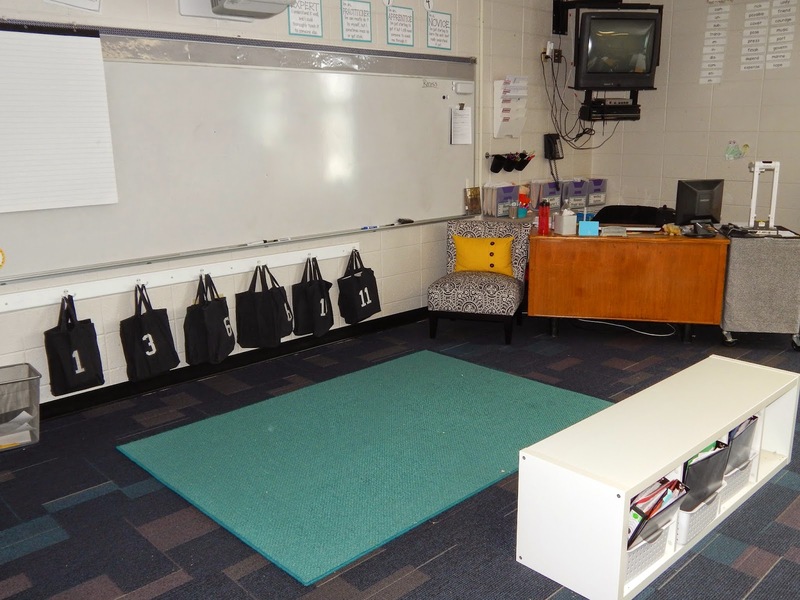 What is the name of the storage/seating unit you have in the front of the class near the carpet. Is it also IKEA? Second, the two tables in front of the windows are actually from study carrel. The tops were broken so my custodian took the tops off and I kept the tables. They are a perfect size! 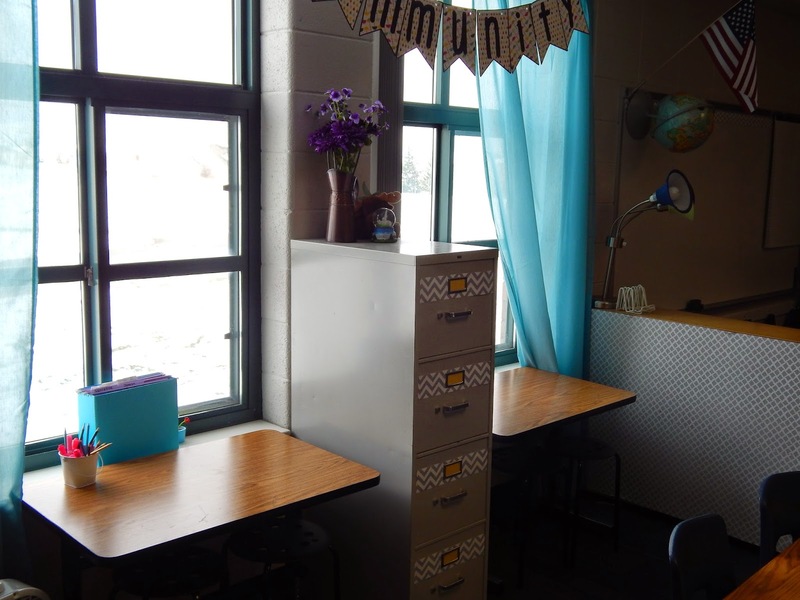 Your blog post helped inspired me to set up my classroom in a very similar way this year! I am really looking forward to it but am also a little anxious. I was wondering if you had any research information or parent information you give out to help explain the alternative seating set up to parents. I would love it you could email me any information I could share with parents. We would be happy to share parent and sub information! Please email us at twonuttyteachers@gmail.com and we will share our blurb at the beginning of our sub plans as well as a letter we shared with parents. We look forward to hearing from you! 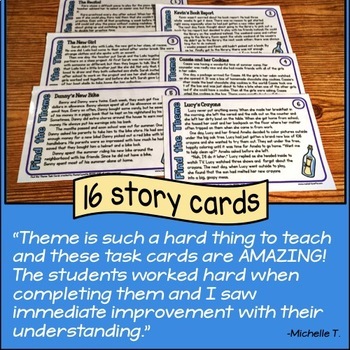 I absolutely love the look of your classroom and the results that you have achieved with it. Unfortunately my room is not as big as yours and is an unusual shape but I am keen to try it for 2016. I was wondering how did you actually introduce this to your class when they began the school year, what was the reaction of parents? If you have any suggestions as to how to initially set up for the beginning of the school year I would love to know. HI, I love your classroom layout and so does my current class. I had a question, if you are distributing morning work or assignments or paper of any kind, how is your distribution handled? In a central place and the kids know where to go? Also, did you assign the “homebase” seats?? Do you just use them for subs or only certain times? 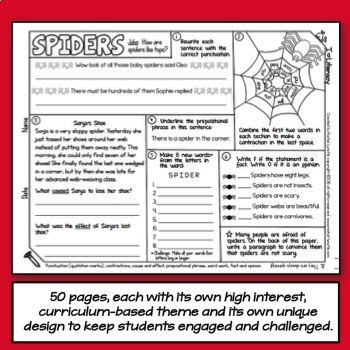 Are there any teachers out there who have used this kind of set up with an older class? 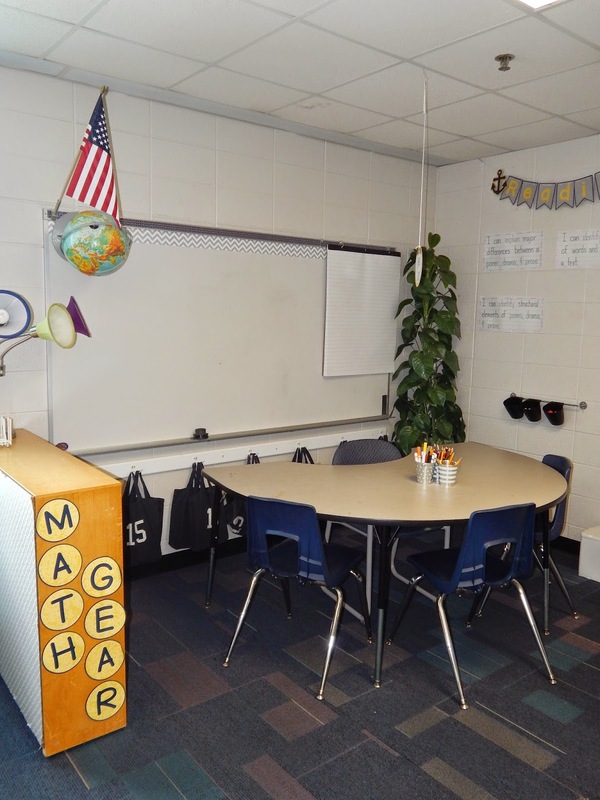 I teach 8th grade and I really think a classroom set up similar to this could be beneficial for my students but I need some guidance on how best to make it work for my older tween/teen crowd. I love this classroom design! I was wondering how this set up worked for assessments. Did you do anything differently when they took tests or were they still allowed to sit anywhere? Where did you get book bags? How do you handle where the kids choose to sit? I am imagining that there could be arguing on who gets to sit where? I love this idea and am thinking about doing it myself but am wondering how that process works. Love your design and I am rethinking my TK/Kinderclass. I really like your design and appreciate the key points of putting boxes in a variety of locations. Thank you for the how-tos! I can visualize my classroom like this. I noticed you still have a desk area, many are departing from that in our building. Pros and cons to doing that? I would love to see your note to parents and guest teachers as well. I’m brainstorming alternative seating options, working with what I have and using it in different ways. Hello! I am so impressed with your classroom design. I am in the process of trying to change to alternative seating. I am pretty excited, but a little apprehensive. My students switch classes for math and ELA as well as content classes. What are your thoughts about switching? Also, do you have any great ideas for the first day of school? I want to get off to a great start, but I am sure few regular desks are going to overwhelm them! Thanks so much! Wow! I’m switching grades from Kindergarten to Grades 4/5 and am really excited to try some flexible seating! I love your room. Right now I’m trying to figure out how to do this using my own money…still waiting to hear back if there is ANY funding available through the school to make my room more child-friendly. Very inspiring post! I am studying to go into middle school science teaching. How do you see this type of set up working when you have multiple periods with different kids? Sorry, if I missed a comment on this already. 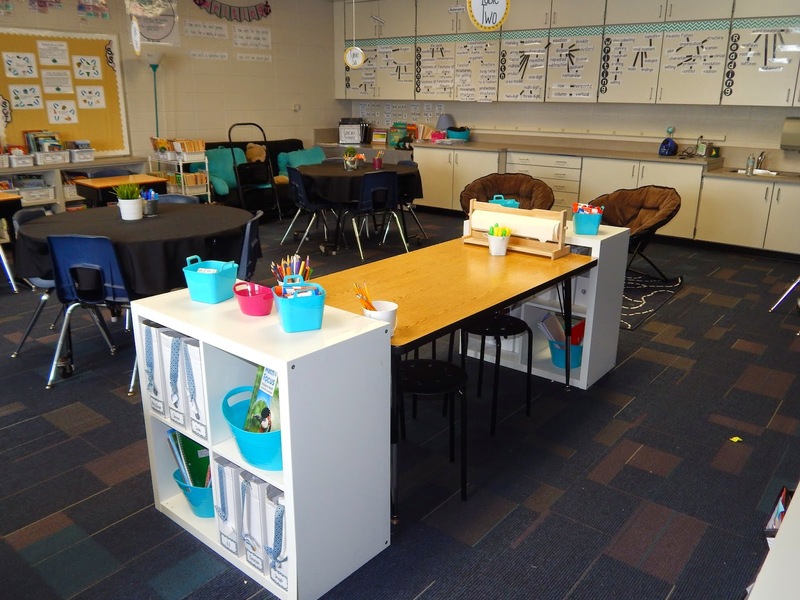 I just found your blog on redesigning your classroom. I have a question about your class library. How are the books labeled. Also, how did you find the genre’s for them all? I’m just seeing this for the first time, so not sure if you’re still responding to it. My question probably sounds stupid, but my new classroom has brick like walls like yours. That’s new to me. How did you hang up the heavier things, like the hooks your husband made, the Ikea looking silver bar/hanging baskets, clock, etc.? Thanks!